Can we Really Get all the Nutrients we Need From a Balanced Varied Diet? The NHS states that “people should get all the nutrients they need by eating a varied and balanced diet”. (1) If this is indeed the case how easy, in practical terms, is this for people to achieve? Sixty seven years later Public Health England and The Food Standards Agency report that no-one in the UK is reaching the RNI (reference nutrient intake) for Magnesium(5) from their diet. 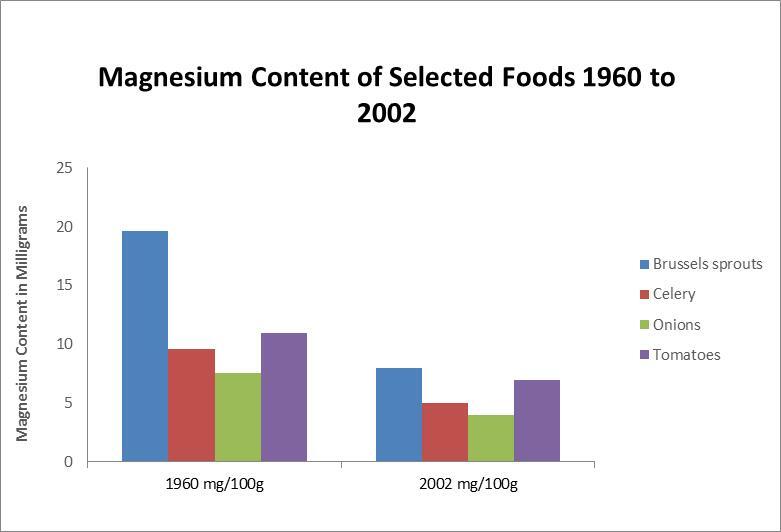 Using the UK government’s Composition of Foods data tables(6), (7), (8), (3) you would have to eat approximately 50% more tomatoes, double the amount of celery and onion and two and a half times more brussels sprouts to get the same amount of magnesium today as in 1960 (see graph below). In practical terms, the top row of plates in photograph below shows just how much you would need on your plate of these four foods to get the same magnesium intake in 2012 compared to 1960 (bottom row of plates). Even if you manage to eat enough to meet the dietary reference value (RNI, RDA, etc.) remember that these levels were created to minimise the risk of under nutrition for healthy people. (9), (10) We may need much more of a particular nutrient if we are looking to optimise our health. Intensive farming practices,(11) new “high yield” cultivars,(12) early picking and long transportation and storage times are some of the contributing factors. Try to buy local and fresh if you can and/or consider a god quality multi-vitamin and mineral supplement from a reputable producer. 1. NHS. Vitamins and minerals – Introduction. NHS; 2012 [updated 26 Novemeber 2012; cited 2014 29 April]; Available from: http://www.nhs.uk/conditions/vitamins-minerals/Pages/vitamins-minerals.aspx. 2. Church SM. The history of food composition databases. Nutrition Bulletin. 2006;31(1):15-20. 3. Food Standards Agency. McCance and Widdowson’s The Composition of Foods, Sixth Edition. Sixth summary edition ed. Cambridge: Royal Society of Chemistry; 2002. 4. Ministry of Food Scientific Adviser’s Division. Manual of Nutrition. Second ed. London: His Majesty’s Sationery Office; 1947. 5. Bates B, Lennox A, Prentice A, Bates C, Page P, Nicholson S, et al. National Diet and Nutrition Survey Results from Years 1, 2, 3 and 4 (combined) of the Rolling Programm (2008/2009 – 2011/2012) 2014 [16 December 2014]; Available from: https://www.gov.uk/government/uploads/system/uploads/attachment_data/file/310995/NDNS_Y1_to_4_UK_report.pdf. 6. Medical Research Council. McCance and Widdowson’s The composition of foods, 3rd Edition, Special Report Series No:297. London: Her Majesty’s Sationery Office; 1960. 7. Ministry of Agriculture Fisheries and Food. McCance and Widdowson’s The composition of foods, 4th Edition. Cambridge: Royal Society of Chemistry; 1978. 8. Ministry of Agriculture Fisheries and Food. McCance and Widdowson’s The Composition of Foods. Cambridge: Royal Society of Chemistry; 1991. 9. Hurren CAMHEA. The scientific basis of nutrition education : a synopsis of dietary reference values: Health Education Authority; 1996. 10. Buttriss J. Nutrient requirements and optimisation fo intakes. British Medical Bulletin. 2000;56(1):18-33. 11. BBC News. Soil health ‘threatens farming’2008: Available from: http://news.bbc.co.uk/1/hi/uk/7685643.stm. 12. Fan M-S, Zhao F-J, Fairweather-Tait SJ, Poulton PR, Dunham SJ, McGrath SP. Evidence of decreasing mineral density in wheat grain over the last 160 years. Journal of Trace Elements in Medicine and Biology. 2008;22(4):315-24. © Penny Priestley/Sirona Health 2014. Under this Creative Commons license people are free to share (copy and redistribute the material in any medium or format) and adapt (remix, transform, and build upon the material) as long as this is not for commercial purposes and appropriate credit is given (e.g., provide a link to the material, and indicate if changes were made. You may do so in any reasonable manner, but not in any way that suggests the licensor endorses you or your use). You may not apply legal terms or technological measures that legally restrict others from doing anything this license permits.